Accepted Scientific Name: Lithops julii (Dinter & Schwantes) N.E.Br. Blooming habit. Rebutialand cactus collection Demjén, Hungary. 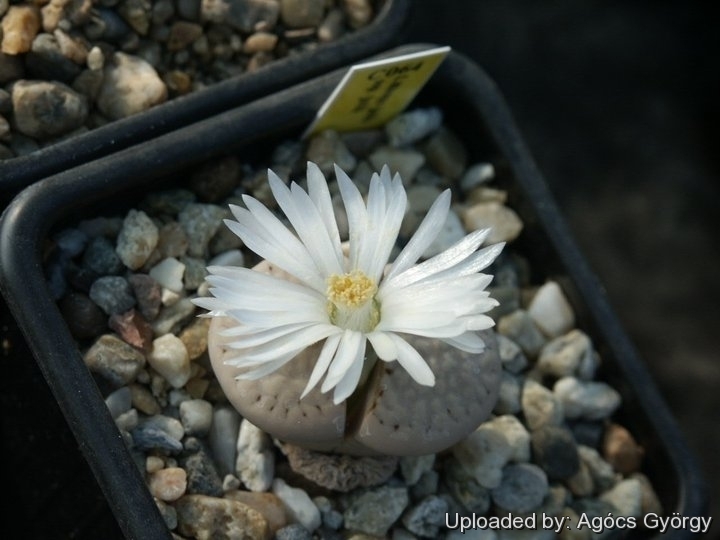 Description: Lithops julii is a very pretty species conspicuously pale, usually pearl- to pink-grey leaves but very variable in colour, with characteristic “lip-smears” which is a distinctive feature of this species. The lip-smear occurs occasionally as a narrow edging or lining all along the outer margins. Three main forms have been proposed and were even given varietal status (“pallid”, “reticulated” and “fuscous”) but wild populations tend to have at least two and many have all three of this forms variously intermingled. Desmond Cole field number C064: This population distinguishes for having a stunning, but variable network.